Some credit for this also goes to Vishal. It is hard to make him eat squash... and the way I like acorn, he does not, at all! For those who are wondering, if it is okay to eat dark acorn squash turned orange over time? Answer is - Yes! it is totally okay! As long as squash feels heavier than it looks, does not have yellow soft patches, and when you cut open, has no mold or rotten smell, it is okay to eat ripened orange acorn squash. In-fact, I think orange-skinned acorn squash is sweeter than dark green skinned squash. Specially when roasted, it tastes delicious, even skin is fully soft and edible! Now, since we talking healthy... I can't resist telling you about few other healthy ingredients in this salad. First micro-greens!! If you looking to add mouth-bursting flavor and ton of nutrients of mustard or basil to a salad with less than a handful of greens, then buy some micro greens in your next farmer's market visit! I'm huge fan of micro-greens especially mustard, basil, and kale greens. Micro-greens supply higher amount of vitamins and carotenoids than their fully grown counterparts! Packed with punch of taste and nutrition, microgreens are here to stay my friends! 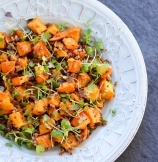 Further, to keep this salad healthy yet filling, I have also included a portion of red quinoa. My salads or veggie bowls, often have more vegetables than base grain. So, I have just used 1/4 cup of dried quinoa for whole acorn squash and 1/2 cup of microgreens. Feel free to increase the amount of quinoa to up-to 1/2 cup. In such case this salad will be good for 3-4 servings. Good you asked! as if I kept it a secret ;) ..... this salad is vegan. drum rolls!!!!! j/k A little creamy-ness is courtesy of 1 tablespoon sesame (tahini) paste. If you don't like sesame, feel free to use 1 tablespoon of any nut butter instead, say peanuts or almonds. Yes, this gorgeous looking salad is gluten free. 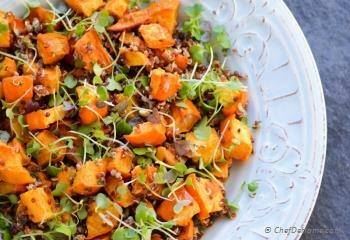 Even then, healthy serving of quinoa and squash makes it filling and satisfactory! 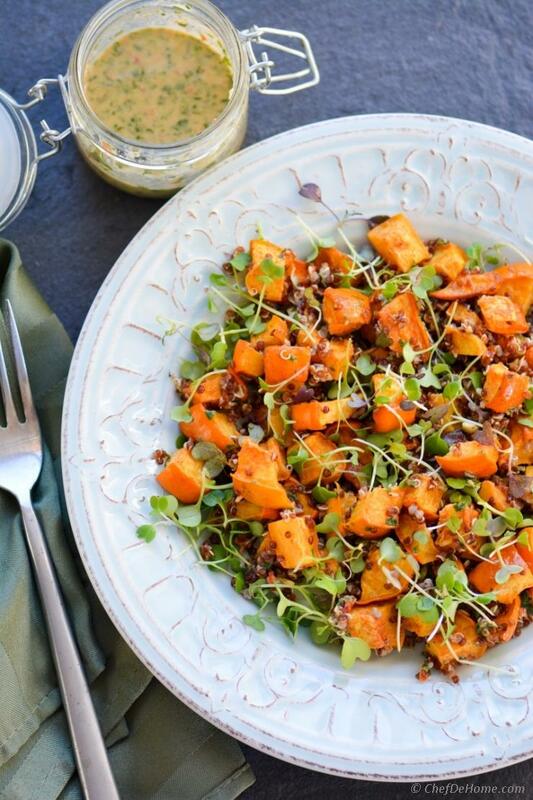 For now, go get some micro greens, empty your squash pantry, and make some roasted squash salad! Just for you! few more salads using microgreens or quinoa! Total Time 35 minutes Prep Time 10 minutes Cook Time 25 minutes Difficulty Easy Yields 2 Servings Serves 2 Notes 2 substantial or 4 side servings. Smart Swap Can't find acorn squash? You can use sweet potatoes instead! 1. Preheat oven at 425 degrees Fahrenheit. Slice acorn to bite size pieces. Acorn's skin get very soft on roasting, so no need to peel the skin. 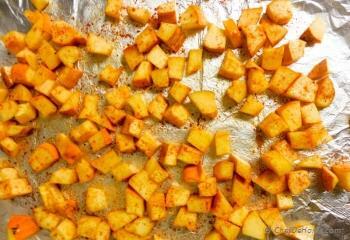 On a baking sheet, drizzle 1 tablespoon oil on squash and toss well, spread squash in a single layer. Season with salt and the paprika. Roast squash, tossing halfway through, until golden and tender, about 25 minutes. 2. 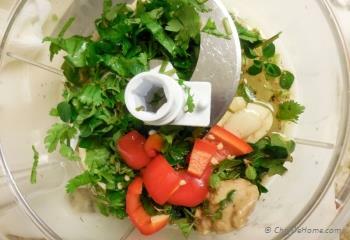 To make dressing, combine all dressing ingredients in a food processor jar. Pulse to make a dressing! 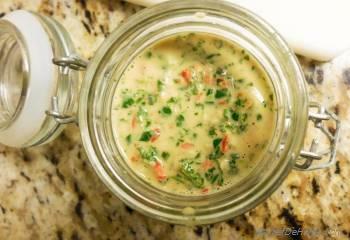 You can also puree it very fine, but I like this dressing to be little chunky, so I pulsed instead of speedy processing. 3. Transfer dressing to a glass jar or container and set aside. Pictures are proof, I too made it ahead! everything cooked at night, packed for lunch in the morning! 4. 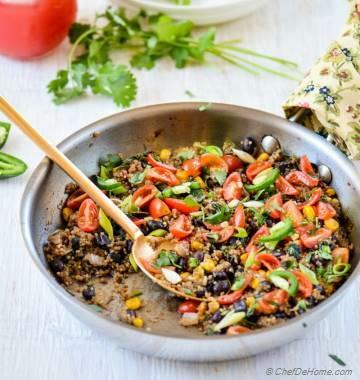 To cook quinoa, rinse quinoa, add to a medium saucepan with salt and 1/2 cup of water, bring to a rolling boil, then reduce heat, cover, and simmer until liquid has been absorbed and quinoa is tender and sprouted, about 15 minutes. Transfer to a bowl, and fluff with a fork. Set aside. 5. Step 2-4 can be finished while squash is roasting. Once squash is tender, transfer it to a salad bowl. Add quinoa, half of the dressing and toss to combine gently. Mix in micro greens just before serving. Drizzle rest of the dressing on top. Serve immediately or at room temperature! Qunioa can be cooked while squash is roasting. So cooking time for this salad is highest of two i.e. time taken to roast squash. You can also add a 1/4 cup of toasted pecans to this salad for some crunch. Make Ahead : All components of this salad can be cooked a day before. 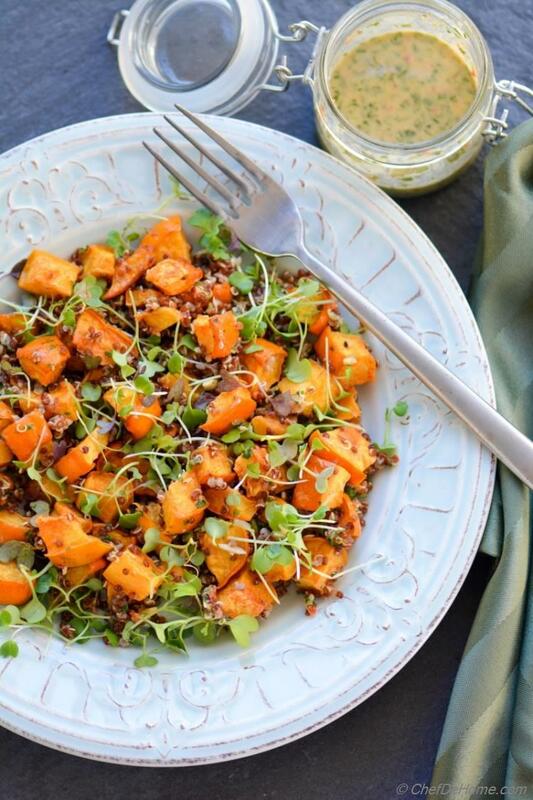 I roasted squash, made dressing, cooked quinoa at night. In morning, to pack for lunch, I tossed everything in dressing and added micro greens on the side. Roasted squash and dressing can be refrigerated, in separate airtight containers, for up to 2 days. Padma, thank you so much!! thanks, Mira! I'm glad you like it! Many thanks for the pin!!! 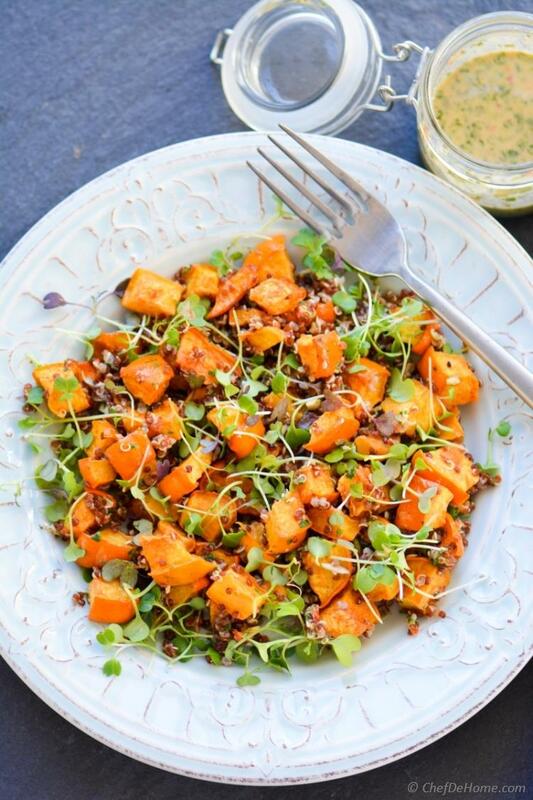 I love squash and in combination with quinoa, this is salad I could eat every day! Thank you so much, Gayle! Indeed, quinoa is everyone's favorite! so healthy and great base for salads and stews! thanks, Oriana! 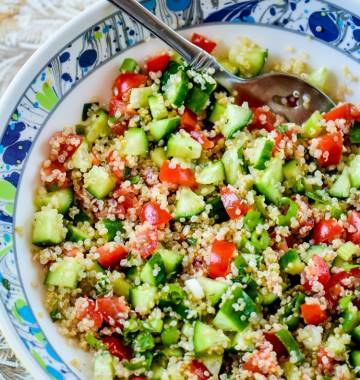 Our love for quinoa is mutual! and... high five.... for pin! 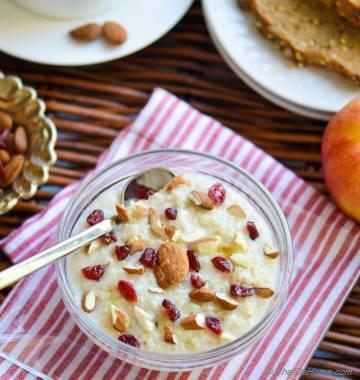 Savita... this recipe looks delicious! I love quinoa and I'm always looking new ways to use it. Trying this soon. Pinned! :) thanks, Gingi! Indeed, micro greens are healthy and very "dandy" looking, I should say!! JayanthiSindhiya, thank you so much! Cheri, thank you so much! Indeed!, this salad looks beautiful! Beautiful salad you put together here, I love roasted squash and quinoa. Great combination! thank God!, I'm not alone!! :) but I still wonder why?? thank you so much, Andrea! I think, I'm also obsessed with roasting squash all the times! because roasting enhances the flavor and makes it so easier to eat squash! thank you much for sharing your thoughts, Andrea! Love to see you around! I'm like you, leaving my squash on the counter for weeks before doing anything with it. :) I like the idea of roasting it for a salad. Yours sounds delicious with the tahini dressing! thanks. Dannii! Me too a quinoa fan. I believe, quinoa is a really great way to add some filling nutrition to our daily diet without undoing the healthy-eating-regime! I'm glad that you like this salad! I'm sure you will love it's taste too! We are big in to quinoa at the moment, so it is always good to find new ways to use it. great recipe! Jeena, all ingredients of this salad are changeable! 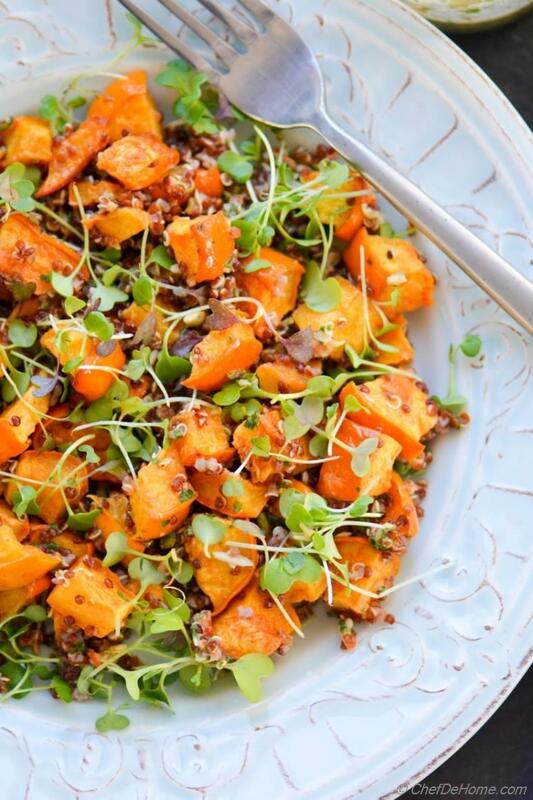 Like you can use sweet potato instead of squash, chopped kale or mustard greens instead of micro greens, and millet or amaranth grains instead of quinoa. I'm sure you will love this combination! One healthy plate of salad this is. Many new ingredients to me though , I am really liking this,. Healthy and delicious salad. Yummy yummy. marudhuskitchen, thank you so much dear! much appreciated!